NASA is preparing to explore unknown worlds. Participants in the Pavilion Lake Research Project (PLRP), with a bit of help from NASA mission planners, hope to conduct their first comprehensive underwater study of Kelly Lake in British Columbia, Canada. Each summer for the past several years, PLRP scientists and astronauts have joined forces to explore Pavilion Lake, an alpine British Columbia lake that is home to a virtual forest of microbialites, formations believed to have been built by microscopic organisms, and widespread on early Earth but rare in modern times. This year, instead of continuing their work at Pavilion Lake, PLRP scientists will be exploring nearby Kelly Lake, which contains a less-extensive population of microbialites. The exploration of Kelly Lake will be conducted by a pair of DeepWorker mini-submersibles, built and managed by Vancouver, British Columbia-based Nuytco Research. The subs will be available for only a week, and each underwater "flight" is a taxing journey in a pressurized vehicle into a dangerous and alien environment, where life-support factors such as battery power, oxygen supply and pilot fatigue must be given priority consideration. In an effort to maximize their scientific return, PLRP will be using planning software developed by the Human-Computer Interaction Group at NASA Ames Research Center initially as a task-planning tool for NASA’s Mars Exploration Rovers. “As a group,” says Mike McCurdy, who leads that software-development group, “we’ve been interested in the analogs for a while, essentially as test beds for future tool development.” Analogs are scientific research sites on Earth where some aspect of the environment or the research process is similar to what future explorers on other worlds, particularly Mars, may face. Lauren Rush, a mission planner from the Johnson Space Center, explains the details of how Score software could be used to support PLRP activities at Kelly Lake. “I think that [PLRP] is very applicable to future missions, because it’s the same idea. It’s putting a crew in a rover, equipping them with what they need to go and do,” she says. Another difference between a scientific expedition like PLRP and a Space Shuttle or ISS mission is the level of autonomy given to the participants. On Shuttle and ISS missions, Rush says, “We tell the crew exactly what they’re going to do, broken down into five-minute increments of every day that they are in space, from launch until landing… From the time they wake up until the time they go to bed, every single thing that they do throughout the day.” Including bathroom breaks. But Kelly Lake will be a mission of exploration. Once they descend below the lake’s surface, a sub pilot may make an unexpected discovery that he or she wants to take unscheduled time to pursue. Learning how to accommodate the give and take of the exploration process is one of main ways McCurdy and Rush believe their groups will benefit from working with PLRP. 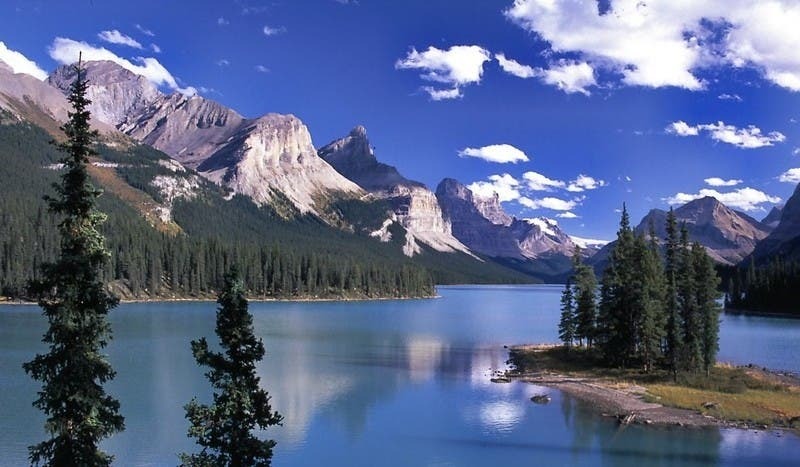 Pavilion Lake in Marble Canyon, British Columbia, is considered a “spiritual place” by the native Tskwaylaxw people of Pavilion. Overlooking the lake is a limestone formation that they believe is a “Transformer Stone” meaning that in First Nations legend it was created by the actions of the “Transformers”, a group of supernatural beings who traveled around the country putting things to right by changing things into stone. The lake, the canyon and this structure all have special spiritual significance to the nearby native communities, but NASA isn’t interested in the spiritually of the place, they believe that what lies under the lake could help answer the question of the origins of life itself. At first glance, the remote lake and the surrounding landscape is not a place where you’d expect to find anything NASA would be interested in, but they’ve been studying the area for over a decade now. What is it they are after? Greg Slater, an environmental geochemist in the Faculty of Science at McMaster University, is a part of the latest exploration effort at the lake. He says the objects of interest are far down below the surface. Unique carbonate rock structures, known as microbialites are are covered with microbes. These mysterious long, red fingers stand like sentinels at the bottom of the mysteriously deep Pavilion Lake, B.C. Are they life forms? An international team of researchers that includes NASA astronauts and a multi-disciplinary team of other scientists, want to answer that question, and by doing so they hope to unlock secrets useful for the search for life on Mars. The unique growths are home to a thriving population of various kinds of bacteria. The researchers are trying to determine whether bacteria built the structures, and if so, how. How are single-celled organisms able to build impressively sized structures, and could single-celled organisms be doing the same thing on other planets as well? "Are they the result of biological or geological processes? Why are there different microbes living on them and how long have these microbial communities been preserved? These are some of our big questions," says Slater, part of an international team researching these strange specimens. This has been an ongoing mystery for scientists. They didn’t know what they were when they were first discovered in 1997, and they still don’t know exactly what they are and how they formed. Now mini-subs called “single person submersibles” that are manned by only person at a time, have been called in to help scientists retrieve samples of the deepest microbialites specimens that may hold vital clues to the history of life on Earth, and on other planets as well. Astronaut Dave Williams, also a professor at McMaster, has been trained as a Deepworker pilot. He says that this new advanced underwater exploration technology will “enable investigators to study previously inaccessible specimens."